What's the D with Bio-D? After reading a few Steiner books, interviewing Biodynamic winemakers, and even getting lost in couple hate threads that claim the practice is all a big hoax, this is my personal opinion on BioD winemaking. First of all, what is Biodynamic wine? Essentially, Biodynamic winemaking incorporates astrology and utilizes the lunar cycle as a guide to planting and tending to grapevines. In addition to this holistic style of agriculture, it is crucial that a winery act in an organic fashion, without the addition of man-made substances.The ideals of organic winemaking stem from the notion that everything in nature survives without chemicals, therefore wine should be no different. Biodynamics, however, takes it a step further and views a vineyard as an entire ecosystem, allowing plants and animals to take the place of chemical additions. Sure, Biodynamics is often described as weird or bizarre and can come with some incredibly dubious techniques. For example, fertilization involves burying a cow horn filled with the manure of a lactating cow, unearthing it in the spring, adding water, and then spraying it around your vineyard. While this hasn’t been proven effective, it hasn’t been proven ineffective either. Biodynamics was founded by Austrian Philosopher, Rudolph Steiner in 1924. With a strong interest in all things agriculture, Mr. Steiner conducted extensive research and identified several commonalities among viticulturists who seemed quite connected to their environments. He took their practices and formulated them into a set of rules and even a calendar for Biodynamic vineyard management. Most of his findings have not been proven legitimate, in fact, several have been discovered as incorrect. What has been recognized effective, however, are his claims on naturally produced pesticides, as well as his instruction for picking grapes late at night. This is when temperatures are coolest, and grapes have the lowest chance of bursting before arriving to the winery intact. If you look into most Biodynamic preparations, they are basically homeopathic in nature and used to heal the earth. Mr. Steiner had a unique mind, attributing intuition as the source behind several of his principles. Whether his findings are completely valid or merely the result his extensive acid trips, many of my favorite wineries are practicing Biodynamic viticulture today. In fact, thousands of winemakers are following his concepts, leading me to the conclusion that Biodynamics isn’t one big hoax. Regardless of the many eccentric practices, the intense attention it forces growers to pay in the vineyard can't be anything but beneficial to the final product. Side note, and perhaps unrelated: Rudolph Steiner also founded the Waldorf Schools. After attending one for 8 years, I can tell you first-hand that, while art projects far surpassed math equations, the 9 other middle school grads in my class went on to be extremely successful in life. Food for thought. Where can I taste one in NYC? You’ll surely find more than a few Biodynamic wines at one of these NYC bars and restaurants. As a Hudson newbie, I've been quite curious about the wines produced between Long Island and the Finger Lakes.. Over the past year, I've tasted through about 20 different producers' wines, which was actually more than I assumed were even here. In a nutshell, while there are way too many sweet wines for my taste, (and blueberry wine, and apple wine -no, I'm not talking about cider), I have come across a few little gems. Two producers (both of whom I've visited) made an appearance at the Rip Van Winkle Wine, Brew and Beverage Festival last weekend and clearly stood out among the others. Check out their Seyval Blanc, which is light and kind of like Muscadet to me, as well as their Baco Noir, which tastes something like a blend of Gamay and Grenache. These two grapes are planted and produced throughout the valley, and I do think (when made properly), they have a chance to really shine. The winemaker is extremely experimental, playing with blends and planting new varietals regularly. They even have an Orange Wine (pictured below), called "Heirloom White" which is a lightly skin-contacted blend of their heirloom grapes. The "Hudson Valley Red" (also pictured below) is a blend of local grapes DeChaunac, Leon Millot, Baco Noir, and Chambourcin. This one tastes a bit like a Beaujolais to me: fruit-forward and perfect for the summer with a slight chill. Unlike Hudson-Chatham, this winery is focusing on Frenchies like Riesling, Chardonnay, Pinot Noir and Cabernet Franc. The acidity on the whites is in line with an Alsacian Riesling or Burgundian Chardonnay, and the "Rebellion Rosé" (pictured below) has Provence written all over it. This easy drinking Rosé tastes like ripe strawberries, wild basil, with a touch of green apple. Their Cab Franc (also pictured), is not shy on the earthiness, with a round body and a hint of dried meat and bell pepper on the nose. Both are perfect BBQ pair-ers and I'm very excited to see where this winery goes. They're doing Pinot Noir for gosh sakes, not an easy task in general, much less Catskill, NY. Know another great wine up here? Comment below, I'm all ears and always on the hunt! Why Bulgaria, you ask? Earlier this year, I was approached by Brand Marketing Organization World Wines, (a professional organization representing the Wines of Bulgaria), about my thoughts on Bulgarian wine. I thought about where I may have tasted one or two in NYC, but couldn’t say what or when. After they graciously gifted me a mixed case, I kept noticing the word “impressed” coming up on my tasting notes. Three months later, I had an invite to Bulgaria from the Wines of Bulgaria team sitting in my inbox. These kinds of things don't happen to me often, but I’m extremely grateful when they do. ;) Needless to say, I agreed immediately. Bulgaria is said to be one of the first countries to produce wine (we’re talking 4,000 B.C.!) In the '80s, Bulgaria was the fourth largest wine-producing country in the world. That changed drastically after a few interruptions, especially the collapse of Communism. Today, Bulgaria's wineries are working hard to produce high-quality wine from local and international varietals. I visited 5 wineries, in 4 different towns, and tasted the wines of at least 25 more producers over meals and bar-hops. Read on for my favorites. Grape Central. This wine bar has a phenomenal local and international list, as well as a seriously inventive young chef. Go there, you will not be disappointed. When asked about Bulgarian food, all I can attempt to compare it to is Greece without the olive oil and Turkey without the spices. It can be quite simple, and pork is definitely popular, along with potatoes, tomatoes, grape leaves and eggplant. Plovdiv is the 2nd largest city in Bulgaria, yet still much smaller than #1, Sofia. The words “cool, hip, and trendy” come to mind when I think of Plovdiv. There are young people everywhere, with several great shops and restaurants along the cobblestone streets. Wine bars are also generously scattered. I compared it to a mix between Munich, Germany and Interlaken, Switzerland. Wineries Visited: The team at "Wines of Bulgaria" did an excellent job sending us to (what I assume to be) the best wineries in the country. Being said, all 5 were fabulous but vary greatly by varietals planted, winemaking styles and overall vision or concept. However, there were several obvious commonalities to me. First, each winery had an extremely modern facility, complete with impressive Bulgarian-made steel tanks and barrels. Touch screens, auto-bottling and labeling machines were commonplace. I expected some very dated technology after google-image showed me that even the best hotels have a late 80s décor. Side note: This was definitely the case, and reminded me much of Cuba. No surprise that the previously Communist rule is the reason for that comparison. I thought it was pretty cool, actually.. I also noticed that our conversations with each winemaker tended to take the organic wine making route. They all clearly knew that the more natural they could be, the more the 10 of us Americans would be inclined to drink (or place an order for) their wines. They’re smart to understand and accept that this trend isn’t going anywhere. Orbelus: This is the winery that’s shaped like a barrel (which you may have seen on my IG). Talk about modern, their unique architectural decision fit perfectly among their vineyards. Orbelus was also the only “Certified” Organic winery we visited, as well as the first to gain the certificate in Bulgaria. They, like many of the others listed below, produce wine from local and international varietals.The Chardonnay and Viognier blend stood out majorly for me. Rupel: This small, relatively new, family-run estate is focusing on the local varietals, Tamianka (white) and Melnik (red). Their winery is just 5 minutes from their magnificent hillside vineyards, overlooking the mountain ranges that separate Bulgaria and Greece. P.S., the Mayor of the town greeted us here with home-baked "Pitka" bread. Adorable! Villa Melnik: I said I didn’t want to pick any favorites but Villa Melnik is definitely up there. After tasting over 20 fantastic wines during our tasting, I still can't get the orange wine out of my mind. It's a subtle orange, (from Sauvignon Blanc grapes) and purposefully so, in that anyone can easily enjoy it. They have a few different lines of reds and whites, varying in price point, which is quite smart for their current (mainly Bulgarian) market. 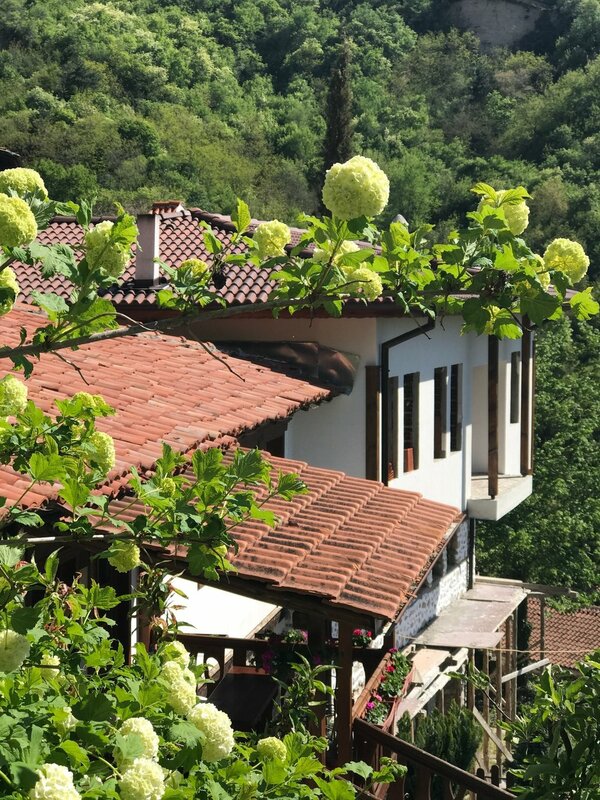 Villa Yustina: This stunning facility sits within a small, yet very ethnically diverse town outside of Plovdiv. This estate also produces the tanks that many Bulgarian wineries are using today (including a few of the wineries I just mentioned). Their huge vineyards are just 10 minutes away and surrounded by a public park where locals and tourists gather for picnics, weddings and public events. The entire park is equipped with free wifi, just to give you an idea of the technological state. 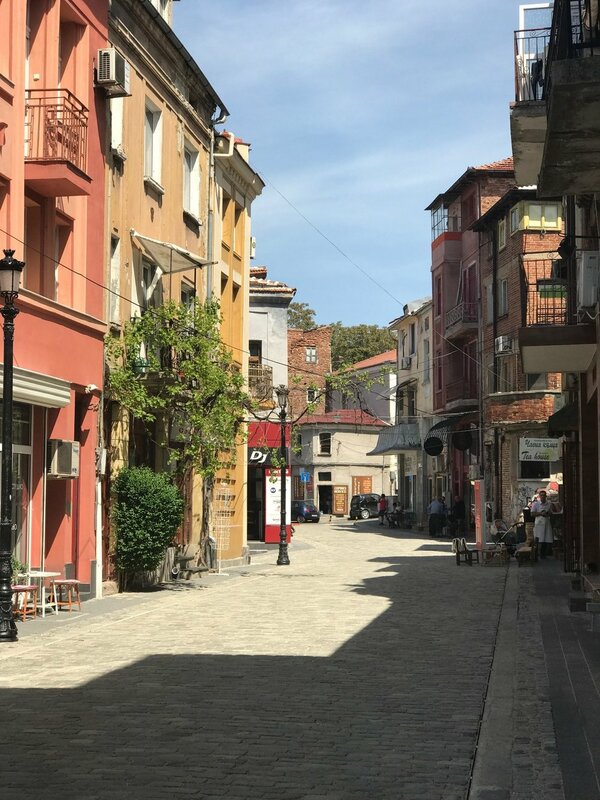 Karabunar: Just outside the happenin’ town of Plovdiv, this winery is doing it all, from Orange to Rose, even the local spirit, Rakia. Their female winemaker is experimenting with unheard-of blends, aging in French and Bulgarian oak, and clearly knows what she's doing. These wines may have been the priciest of all, but for good reason. Zornitza Family Estate: This hotel, restaurant and winery is something straight out of a travel mag. Complete with pool, wine cave and 10 separate villas, it reminded me of Tuscany, but everything was half the price. Clearly, the market for Bulgarian wine is quite small, but I believe that New York is the perfect market for them. With trendy wine bars popping up all over the city, Brooklyn, upstate, etc.. it seems the younger generation has become quite fascinated with the unknown. So many of the wines I tasted on this trip reminded me of my favorites from the Rhone Valley or Languedoc. They’re interesting but they don’t taste weird. The acidity was in line, they every wine is very clearly Old World, the balance was evidently fought for, and almost everything tasted surpassed my price expectations. The group was always asking “how much” (as wine professionals tend to do) and then proceeded to look at each other in astonishment. The wines, hotels, and restaurants are all quite inexpensive and always managed to over-deliver. I would definitely visit Bulgaria again, and urge anyone else to, especially now and before this Balkan secret gets out. “Sparkling wine goes with everything,” a phrase we commonly hear when pairing bubbly with food. Technically speaking though, I have to disagree. Some sparkling wines are so light, that they rarely pair well with some of my favorite seasonal dishes. I’m always on board with comfort foods in the winter, and made it my mission to pair these rich, substantial side dishes with a sparkling wine. Why? Because I love my bubbly, duh. Luckily, I found Gloria Ferrer as proof that bubbles can in fact stand up to my winter go-tos. Perhaps this is due to their warmer climate and Carneros situation, which gives their sparkling wines a little more umpf. Gloria Ferrer was founded and stilled owned by the Ferrer family of Spain. In fact, they were the first winery in the Carneros AVA over 30 years ago! Today, with 335 acres under vine, the vineyards produce some of the best Pinot Noir and Chardonnay, both of which are used for sparkling and still. Similar to the production in Spain, the family makes sparkling wine in the traditional method only. This isn't always the case for wineries in California. I can personally notice a heightened complexity and immensely longer-lasting bubbles, due to the secondary fermentation in the bottle. A delicate sparkling wine with a full-bodied palate. Hints of ripe raspberries and red roses complete the fruit-driven nose and toasted almonds on the palate. With effortless minerality, this sparkling wine can pair easily with slow-cooked seasonal vegetables, like my roasted carrots or charred Brussels sprouts. Brioche, orange blossoms and ripe pear graze the nose, while green apples and lemongrass complete the palate. Extremely well balanced, this highly textural sparkling wine can easily stand up to cream sauces, (even my rich risotto) as the acidity cuts right through the fat. Don't believe me? Try these three recipes with Gloria Ferrer’s Blanc de Blanc and Sonoma Brut. 'Tis the season to start creating your Thanksgiving menu and wine list. Here are three wines that I've been ridiculously into and can't wait to see what they do with the traditional fixin's. Elbling is a ridiculously fun and interesting German grape, and this one hails from the steep slopes of the southern Mosel river valley. The soil type here is a shell-based limestone, which is shown off on the palate. Minerality is the motto here, with notes of river fish, brine-y oysters and sesame seeds. Complex, fresh as hell and completely dry, I'd pair with soft cheeses, arugula salads and squash. From the always interesting Arbois region (Jura, France), the Poulsard grape is one of the thinnest-skinned in the world. The marl soil and biodynamic practices both shine through upon tasting. I knew the tannins would be rather low, but the body surprised me. This is quite mouth-coating while tart cranberries and raspberries are balanced between lilicorice and spice. It's basically cranberry sauce in a wine glass, and the powerful earthy tones make it perfect for light turkey and mushroom stuffing. I'm always on the hunt for Marsonnay, as the region consistently produces great red and white Burgundy at a major value. In a traditional style, this Pinot Noir is quite inviting with just a touch of new oak. Ripe dark cherries, raisins and balsamic grace the nose, while the palate is a bit more complex and mineral. Notes of white mushroom and salami are released on the long finish. Ready to drink now, and easy to pair with slightly heavier sides, including casseroles and gravy-glazed potatoes. Last night, I was fortunate enough to pour (and sit) at a private Bordeaux tasting. The host urged me to select non-first growth, as he knew them well - the ones that were drinking anyway. So, below are three of my choices, none of which I'd had prior, and my tasting notes. From Youngest to Oldest, the 2005 Chateau Pavie was immensely powerful, with surprisingly shocking texture with 11 years of age at this point. Notes included tobacco, blackberry jam, new oak, granular tannins, I'd give this 98/100 but not without food. The 2003 Cos d'Estournel was quite complex and included notes of lavender incense, raspberry cassis, and several exotic spices and herbs which were difficult for me to pinpoint. While it was wonderful now, the tannins drove slightly, and I'd be interested in opening this again in 2019/2020. Last, the 1998 Cheval Blanc. What can I say? This wine absolutely stood up to the hype and high scores. Leather, plums, raisins and menthol surround the nose and palate, and you're left with a clear balance of full body, polished tannin and ripely pure fruit. Entirely complex, I noticed smokey, campfire and milk chocolate throughout the hour I slowly enjoyed it. 6 greats from the old world, a private tasting by Hillary Zio, enjoy! Gruner Veltliner is the signature grape of Austria, and lately you won’t find one of poor quality exported to America. Brundelmayer is located just west of Vienna, in the region of Kamptal. With stony soil, very high in elevation with cool terraces, this wine has bright and fresh acidity, with several unique floral notes, as well as grass, limeade and a hint of asparagus. Stephane Moreau was labeled the most exciting new producer of Chablis by Burghound in 2012 and his wines have only gotten better. Learning from Vincent Dauvissat, his wines are also deeply mineral, displaying the kimmeridgean soil seemingly effortlessly. He uses ancient barrels and just a touch, to express the racy terroir. Green apples, orange peel and a hint of clay from the soil are notes you can find across the palate. Biodynamic and only hand-harvests, these wines are under the radar – for now. Pierre Duroche is a 2nd generation winemaker and took over from his father in 2005. Their wines are all about elegance and finesse, not oak and power, which can be a bit rare to find in Gevrey Chambertin. They have 8 hectares of micro cuvees, encompassing 5 Grand Cru vineyards and 3 Premier Cru sites. This is the “champ” a lieu dit to the North of Gevrey Chambertin. The tannins are fine grained, and the nose is earth-driven and vegetal. Very well balanced with a long finish. One of the largest (500+ hectares) and oldest (est. 1878) producers in Rioja (Alta and Alavasea), offering a very traditional and consistent style year after year. CVNE’s Gran Reservas are aged 24 months in cask and 36 months in bottle, and these Tempranillo vines are at minimum, 20 years old. The family (5th Generation) and winemaking team are known for their low yields and American/French barrel combinations, both resulting in the classic style that sets them apart. Black cherries, fresh berries, toast, dill and balsamic come across on the nose and palate. Small and pristine, Giancarlo Pacenti is making beautiful wines in the heart of Montalcino. The Brunellos and Rossos have been highly rated and described as perfectly balanced and age-worthy. This has to do with the blend of 2 vineyards he owns to the North and South of Montalcino Hill. Pelagrilli is his vineyard to the north, offering elegance, fragrance, and a silky texture. The Southwest, warmer vineyard is located in Colle and known for full-bodied and dense tannins. By blending the two, he is able to create very unique wines with an abundance of power, fruit and finesse. Located in Margaux, 2008 is considered one of the best vintages of Brane Cantenac EVER! This second growth Bordeaux is 75 hectares long, with history going back to 1833. Today, the estate is over 25% organically farmed, using sustainable techniques, this number goes up each year in an effort to preserve the region. The blend is 55% Cabernet, 40% Merlot, 4.5% Cabernet Franc and .5% Carmenere. The wine is blended and then aged 60% new French oak. The palate is complete with notes of tobacco, cassis, mushroom, and truffles with a dark cherry and blackberry finish. Clean and elegant, it’s easy to see why this vintage has been so prevalent for the chateau. Don Tony Perez has only been in business a few years, producing both whites and reds within the Curico Valley. This is one of the largest and oldest wine regions in Chile, located in the center of the country. With so many micro-climates along the coast and even inland, several varietals can be made within the region. In preparation to represent this brand, I tasted six of them and was wildly impressed. Tasting notes below! A very approachable and enjoyable white blend consisting of equal parts Viognier and Riesling. The nose demands your attention with a plethora of tropical fruits like mango and pineapple. There’s a hint of vanilla, indicating the soft usage of (partial) oak. The weight is delicate but the tropical fruits are confirmed on the palate, and even a bit more raisonated and candied on the finish. Several other fruits exist across the finish, including golden pears and passionfruit. Again, nothing overwhelming or out of place, this white blend is surely a crowd-pleaser. This red blend is charming and exceptionally well balanced. The aroma leads with fruit and includes notes of dried figs and blackberries. The palate consists of leather and spices, with a touch of coriander on the finish. While the tannins are quite intense, this is definitely a food-preferred wine. I’d recommend a ragu or meat stew to pair best with this blend. This is a stunning expression of the Syrah grape and fully came to life after decanting. The nose consists of licorice and stewed fruits like blackberry jam, cranberry sauce and orange marmalade. Very complex, as the palate is quite different than the nose. Secondary flavors of red pepper flakes, pine needles, chocolate and candied currants exist across the palate and throughout the finish. While a very fully bodied wine, the tannins are smooth and do not overwhelm. Exceptional and multifaceted! This wine is extremely fruit forward, conceivably due to the young age. The nose is bursting with boysenberries, blackberries and cherries. Some secondary aromas exist and include fresh ground pepper and red roses. This wine is very interesting and I'd like to see how it develops over the next few years. Still young and very powerful, I would pair with steak or grilled sausages. This very concentrated wine has aged beautifully. All of the right Cabernet qualities are present on the nose and palate. Some tertiary aromas include granite, soil and smoked meat. The tannins are well integrated and the body is quite full. With such a long finish and several fascinating flavors, I can see this wine developing beautifully over the next five years. I may know a thing or two about wine, but cooking isn't my strong suit. As far as recipes, I need 'em short, easy, and complete with pics, videos, puppet shows, you name it. So, over the last few weeks, I tried DOZENS of summer recipes that I found on Google, Pinterest, and Instagram, claiming to be quick and easy. Today, find my Top 6 Sommelier-tested Summer Recipes. These Chefs know how to make delicious meals AND how to break it down for beginners. Simply click the recipes, or type in the below links and start cookin.' Comment for wine pairing advice! - Beet Salad and Aged Riesling: When funky meets aromatic. You’ll likely have a goat-cheese component here, so the acidity in a German Riesling will cut right through. Also, the beets (and maybe some arugula) will sing with the wine’s earthy elements after a few years in the bottle. If you have a golden beet love affair, remember that they are a bit more neutral, so stick with a Riesling with age that won’t overwhelm with shocking fruit and florality. - Tuna Tartare and New Zealand Sauv Blanc: I honestly thought this would be too much, but the tropical flavors brought out the sesame in the dressing. The pair also had a matching trace of jalapeño that heightened the spice. As one of many with “hot sauce in my bag swag,” this is an intense, but very much hell yes pairing. - Pulled Pork Tacos and Sangiovese: To be clear, I am NOT talking about Brunello, or even most Chianti. I’m talking about that Rosso that every blind taster at the study group calls a Pinot Noir. The oak is pretty much non-existent, but we’re still working with a medium body for that obvious Chipotle sauce and slow cookin’. Can I get some slaw though? Don’t get syrupy with me, we need to balance it out with a little lime sauce, cilantro and vinegar. THANKS! Any passionate collector of white Burgundy undoubtedly turns to Chassagne Montrachet and Puligny Montrachet when looking to appreciate and expand their cellar. The infamous, aforementioned Premier Crus habitually provide a divine expression of the Chardonnay grape. Further, I have two favorites I'd like to share, within each sub region. Le Domaine Francois Carillon, of Puligny are known for their 15 generations of farming and extensive winemaking expertise. Recognized to produce wines of racy elegance, Carillon perfectly exemplifies the Puligny terroir. Domaine Michel Niellon of Chassagne contains predominately old vines within their few plots. The estate relies on low yields, which gives the wines intensity, but results in a low supply. This, along with Niellon’s massive following, makes securing bottles very difficult, but rewards immensely. 2.) 2014 Copain Pinot Noir: Always delightful, from the Sonoma Valley, this could easily pass for old world, with their fresh and earthy style. I heard someone describe it as tasting "like the mountain-top," which might be due to their high altitude vineyard locations.. who knows. Also, feel free to go back 3-4 vintages if you can find them, because this stuff ages beautifully! 3.) 2014 (or '13) Tami Frappato: From Sicily, by the ever popular natural winemaker, Arianna Occhipinti (#girlboss), the 2014 vintage has been clearly perfected. The raspberries and strawberries on the nose are meant to offset the rocky minerality. Keep in mind, the touch of heat makes this one grill-ready. Try it with a burger or a bratwurst, you'll find it gracefully keeps up. 4.) 2014 Via Arxentea Mencia: The Spanish wine to know this summer! From the region of Monterrei, everything about this well-balanced red screams BBQ. The bell-peppery charm is stylishly balanced with clove due to the portion of new oak used to age. You'll be reminded of smoked sausages and mustard, clear components to successful grilling. 5.) 2014 Rosi Schuster Zweigelt. Welcome to one of my favorite, much lesser known varietals, Zweigelt. This particular Austrian producer really over delivers. With fine-grained tannins and a plethora of cooking spices and herbs, you would think I was talking about a wine worth hundreds more, and maybe it should be. Perfect pairing? Grilled eggplant or pork chops. While there are always trendy estates, the following 3 California Pinot producers have been increasingly asked for over the last year. First, Kistler, with their Burgundian styles and France-worth acidity levels. They have effectively put the Russian River Valley on the map. Then, the great wines of Peter Michael, and his 15, single-vineyard bottlings, in their most ideal (not to mention picturesque) western-facing situation. These terroir-driven wines have proven to stand the test of time. Finally, Rhys, while more of a new-comer in comparison, is clearly worthy of the recent praise from critics and wine experts throughout the world. Their mountainous terroir and rocky soils have differentiated them in Pinot Noir production with a very unique style. Feel free to reach out with questions regarding these fabulous estates, and remember, everything ships now! Lately, we’ve been discussing the 2011 vintage for Brunello. 2010 was a very hard act to follow, but wineries are not disappointed after tasting their new releases. The 2011 vintage wasn’t uniform like 2010, and there were some extremes in the weather. To make the right choices in 2011, you needed to know your vines as well as you know yourself. I’m placing my bets on the seasoned winemakers with an advantage when it comes to location. Marroneto is just that, based on a traditional and minimalist philosophy since planting their vines in 1975. Secure yours at Vinfolio.com!